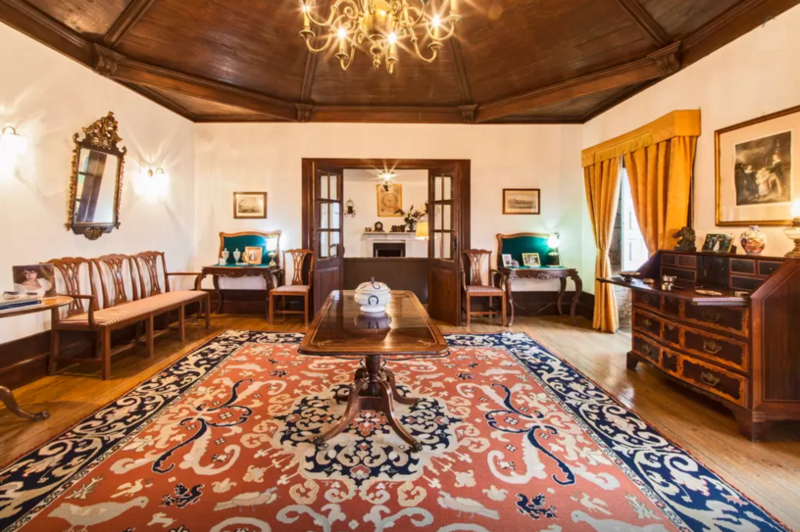 Casa da Povoa was built by the owner’s 6th grandfather back in in the XVII-XVIII th Century and it is a beautiful home that can represent the typical architecture of the manor houses in the region Douro. The coat of arms that is attached in the facade of the chapel belong to the family of the mentioned 6th grandfather. The house is located in the region of Douro and is part of a property with 100 hectares, which is about 2000 meters edge of famous Douro River. In front of the house at 1000 meters, a hydro-electric dam (Dam Carrapatelo) with locks for passing ships of Tourism and Commerce, up to 90 meters in length. The house has 5 bedrooms, one with double bed and full bath attached, one bedroom with double bed and 3 rooms with 2 beds. The house also has five livings, one is the dining room, an entrance hall and two living rooms with fire. There is also a large room that was before the old kitchen and after the renewal of the house (1997) is transformed into a living. It has a new kitchen with complete equipment..
By request, it is possible to recruit a maId, who lives in the estate. She can take care of the housekeeping and cook. She cooks great meals typical of the region. There is a cleaning service every week, which includes cleaning the kitchen, bedrooms and bathrooms. At this time she also replaces sheets and towels. The garden is large with beautiful fruit trees, oranges, mandarins, cherries, lemons, apples, etc.. In the garden are going to find a beautiful green fat. It is also placed in a pool with a beautiful view of the river and the dam. The house is located at 8km from the village Cinfães or you will find supermarkets, and restaurants with typical food of the region. Walks along the river can be done either by car or on the train to see the famous Port Wine Vineyards. There are also farms ‘Quintas’ or you can visit to taste good table wines from the Douro and even Port wine. Boat rides in the river are desirable in such river cruise boats. These trips can range from Porto to Barca d’Alva, on the border with Spain, either in the whole or partially.